Plus, Introversion talk about the game's low sales. Scanner Sombre, as it turns out, hasn't sold very well, at least compared to Introversion's previous game: the 2-million-copies-sold-and-counting Prison Architect. 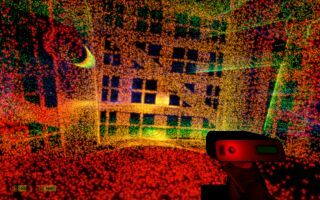 By comparison, the developer's first-person cave-mapping game Scanner Sombre has only rustled up around 6,000, or in the words of Introversion's Chris Delay, "It's bombed". Delay, and Introversion co-founder Mark Morris, chatted about the game, and its sales, in a frank new YouTube video, while also finding the time to show off Scanner's previously teased VR mode, which is now live in beta form, and playable on HTC Vice or Oculus Rift. Click here to learn how to opt in to that beta on Steam. Here's Delay speaking about Scanner Sombre's sales, via Gamasutra: "It's bombed. I didn't think that was possible. It's not that I arrogantly believe we're the best people in the world or anything, it's that our last game sold over 2 million. So I kind of wrongly assumed that would just give us a minimum number of people looking at our game. So that numbers like [6k] would be impossible." Scanner Sombre is currently 50% off in the Steam Summer sale. You can read Tom Marks' review here.